LSD Projects & Latin Soul Dance Entertainment - provides professional dance shows fusing Salsa, Mambo, Cha Cha, Guajira Son, Bachata, Argentine Tango, Latin Jazz with Afro Cuban, Flamenco, Ballroom and other dance influences. The company has graced numerous stages at hispanic cultural dance festivals, salsa congresses, artistic & cultural venues, corporate events, entertainment venues and at private parties for up close and personal dance entertainment. Latin Soul Dance Entertainment - Lively, Sizzling, Dynamic! A sought-after Latin dance entertainment company in tri-state area, providing sizzling performances and highly professional dance services with competitive rates in NY/NJ/CT/PA area. 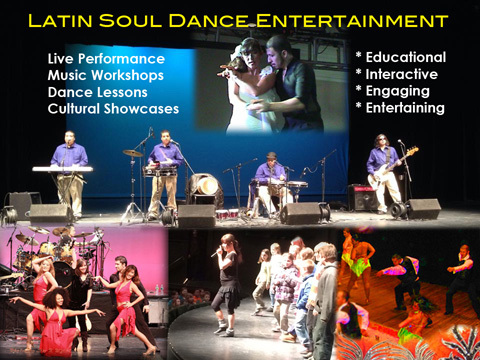 Latin Soul Dance Entertainment is an elite group of professional dancers, certified dance instructors and seasoned performers who entertains and teaches at corporate, education, cultural, media, entertainment, social, weddings and private events. We offer motivation dance lessons, guest dance services, choreography, educational workshops, cultural showcases, dancing with live band & DJ music services for all occasions. Our colorful choreography incorporates Afro Caribbean Latin rhythms fusing Salsa, Mambo, Cha Cha Cha, Cuban, Cumbia, Bachata, Merengue, Bolero, Ballroom, Tango, Latin Jazz & various dances in stage-ready productions and up close & personal dance entertainment. We offer "Dancing with the Stars" style couple dances that are "sensual, fun and elegant" - top choice for weddings, birthdays, socials and private parties. We also provide multiple couples group dance showcases that are "explosive, exciting and exhilarating" - corporate, education & cultural clients' favorites! Cynthia La Chinais a passionate teacher and veteran social dancer specializing in NYon2 Mambo/ club-style Salsa and other Latin dances. A designer by day, dance coach & performer by night, she has been teaching dance, performing and choreographing routines to all ages and ethnic audiences as alternative outlets for artistic expression and creative thinking since 2000. Cynthia first took up Ballroom dancing and was swept away by the rhythmic flow of smooth ballroom dances, however it was the flirtatious and exuberant side of Salsa that got her hooked. With a dedication bordering on obsession, she spent all her spare time training in techniques and other dance forms in Jazz, Modern, Ballet, Flamenco, Belly dance, Ballroom, Cha Cha, African, Argentine Tango, Hustle, Swing, Salsa and especially club-style NYon2 Mambo. In fact, her trainers are Who�s Who of the Best Instructors, including Eddie Torres (Pioneer of NYon2 Mambo), Duplessey Walker (Styling & Technique), Frankie Martinez (Afro Latin Funk), Jami Josephson (Ballroom & Hustle), Dave Paris (Lifts & Tricks), Michael Fielder (Latin Jazz), Amanda Estilo & Karisma Dance Studio (Styling & Partner work), SantoRico Dance School (Spin Technique), just to name a few. Having excelled in Salsa within the first year, Cynthia was invited to perform with an all-female dance team from Brooklyn in 2000. Since then she has danced and performed with many professional dance companies, including Duplessey Latin Dance Factory, ENIXE Dance, Mambo2ChaCha Dance Company, Revelation Dance Company, Michael Fielder Latin Jazz Team, Jami Josephson's Rhythm Divas and Tropical Image Dance Company. Cynthia is now Artistic Director of LSD Projects/ Latin Soul Dance Entertainment, co-founded with her dance partner, Hector el guajiro. Together they have traveled extensively for teaching and performance gigs in NY, NJ, CT, Boston, Philadelphia, Washington DC, Hawaii, Las Vegas, Miami, Puerto Rico, Dominican Republic, Canada. Hector El Guajiro Pe�a was born in Texas, and had grown up around Spanish/Mexican folklore music. Since early age, he was hooked on Cumbia dance. Coming to New York in 2000 had opened his eyes to NYon2 Salsa, and also began his Salsa/Mambo journey with "The Mambo King" Eddie Torres, and had furthered dance training with Frankie Martinez of Abakua Dance Company in Afro-Cuban movement, styling and Cha Cha Cha. In 2004, Hector joined Revelation Dance Company as a performer and co-choreographer, and had performed in numerous Salsa festivals & congresses in Puerto Rico, L.A., Boston, Philadelphia, Washington D.C. and more. Hector met Cynthia in 2007, and found that they shared common goals as dancers, instructors and creative ideas as performers, choreographers. In 2009, they co-founded "Latin Soul Dance Projects & Dance Entertainment" (LSD Projects) where they draw inspirations from all dances (Afro Caribbean, Latin Jazz, Modern dance, Tango, Ballroom and Funk) to incorporate into their choreography. Together they have performed and taught at multi-cultural dance festivals, salsa congresses, cultural institutes, artistic venues, corporate venues, private clubs and entertainment venues in Hawaii, Las Vegas, NY, NJ, Boston, Washington DC, Punta Cana, DR, Canada and more. Lisa Linhardt, MamboFateegz.com, MambOn2.com, JustSalsa.com, MamboPics.com, PartyforFreeNYC.com.